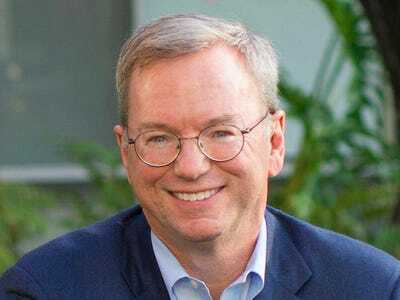 Google chairman Eric Schmidt and former svp/product management Jonathan Rosenberg were in London recently to promote their new book “How Google Works.” We attended a conversation about the book and told you what they look for when hiring new people at the company. But sometimes Google needs to get rid of people too, especially when a staffer isn’t a good fit with the company. 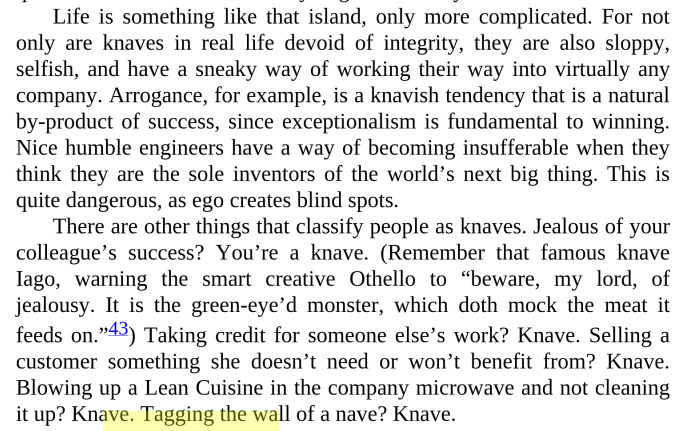 In a chat about Google’s internal management techniques, Rosenberg said that the company was constantly on the lookout for “knaves.” Knaves are employees that are so annoying or ill-willed that they drive away the good employees. 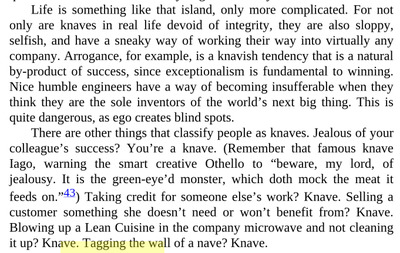 Too many knaves can cripple a company, Rosenberg says, so preventing high levels of “knave density” — the level of bad employees concentrated in any one team — is crucial. “If you get more than a few of these knaves, people don’t want to come to work in the morning”, he said. So what does a knave look like? Knaves “lie, cheat, steal, and take credit for other people’s work”, Rosenberg said. He also said that knaves “leak, cheat, lie and steal”. That last bit about leaks was interesting, and goes some way to explaining why, despite the fact that it has roughly 48,000 employees, Google employees rarely tell the media stories off the record.